Noel Gallagher has waded into the debate over youth knife crime while picking up a prize at the Silver Clef music awards in London. The Oasis guitarist said it was a "pity scumbags are taking over our streets", and claimed video games were partly to blame for violence. He said: "In my day, status was trying to be somebody, do you know what I mean, not trying to kill somebody?" The star said knife crime was a problem across the UK, not just in London. The 41-year-old added: "I was up in Liverpool for a week a couple of weeks ago and even on the news there it's every single night. "I don't even know what Cameron or Gordon Brown are going to do about it. I was watching a documentary on Panorama and another one about kids carrying knives and violence. "One of the lads, a little lad, made a telling comment. "And he said, 'Yeah, there probably is but I've never known anything else'." Gallagher also revealed that he and partner Sarah McDonald were worried about their children growing up and said they talked about knife crime in bed at night. "People say it's through violent video games and I guess that's got something to do with it. "If kids are sitting up all night smoking super skunk [cannabis] and they come so desensitised to crime because they're playing these video games, it's really, really scary." Eighteen teenagers have been murdered in London so far this year. In response, the capital's Metropolitan police force have set up a task force of 75 officers, dedicated to fighting knife crime. The Oasis guitarist also defended his comments about Jay-Z headlining last weekend's Glastonbury Festival. He said: "The broadsheets get hold of it and have me going down Hyde Park Corner blasting and slamming. "For the record, I Iike Jay-Z. That's my opinion. "If it offends people, don't ask me any more questions. "I should do these things and answer like every two-bit pop star." In April, Noel Gallagher said having the rapper at the festival was the reason tickets had not sold out and that it was "wrong" to have a hip-hop headliner. 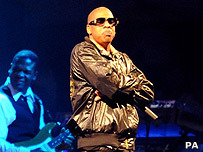 Jay-Z played the guitarist's comments to the crowd at Glastonbury in a video montage before his set and played an acoustic version of Oasis hit Wonderwall. 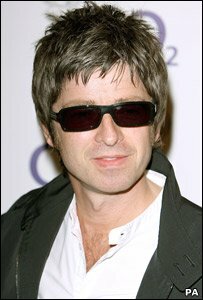 Music chain HMV say the performance has helped boost sales of Oasis's album (What's The Story) Morning Glory, as well as the single Wonderwall.